PBT Ball Transfer and PPD Positioner Pad Strips are available with ends tabs for mounting in conveyor lines or without end tabs for your own projects and applications. Omtec PBT Ball Transfer and PPD Positioner Pad strips are ideal for roller conveyor assembly workstations! the PBT Ball Transfers raise the item to allow minimal effort orienting and positioning of an item. PPD Postioner Pads raise the item above the PBT Ball Transfers to locate the item in a firm stable position allowing a task to be performed. and PPD Positioner Pads to allow items to continue down the conveyor line unaffected by the Omtec Strips. Omtec standard is to place the first and last PBT Ball Transfer and PPD Positioner Pads 1.25 inches (31.75MM) C/L from each end of the main body (between frame dimension). The other PBT Ball Transfers and PPD Positioner Pads are evenly spaced. 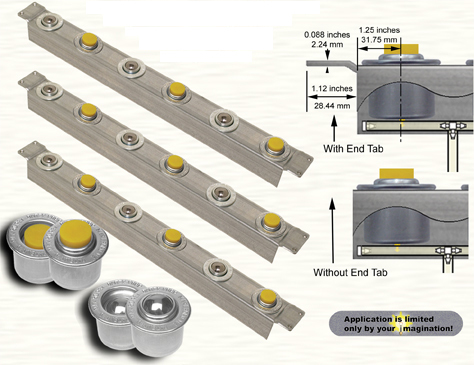 Omtec PBT Ball Transfer and PPD Positioner Pad Strips may be any length. The number of Ball Transfers and Pads on a strip may be varied and located on any center lines desired. The minimum center line is 2 inches (50.8mm). Omtec PBT Ball transfers and PPD Positioner Pads are pneumatic (air operated). The air in feed line is a single 0.180 I.D. X 0.265 O.D. polyurethane tube under the strip between the first and last ball. The standard in feed tube supplied is 8 inches (203mm) long attached between the first and second Pad, but can be any length or location on the strip desired. Virtually any air control device may operate Omtec PBT Ball Transfer Strips. In the majority of applications simple non-electric foot and hand valves are used. The Omtec PPD Positioner Pads use very low air volume, it is usually not a consideration. Each up and down cycle of one ball uses .00038 cubic feet (.0000108 cubic meter). If needed sensing device operation using electric solenoids valves may be used, control kits are available. Omtec PBT Ball Transfers and PPD Positioner Pads like virtually all pneumatically operated components require Filtered, Regulated and Lubricated compressed air to operate.